Pioneers in the industry, we offer navratna tree, feng shui love bird, wealth cow & wish fulfillment cow, mandarin _ducks, crystal pakoda tower and wooden wind chime from India. 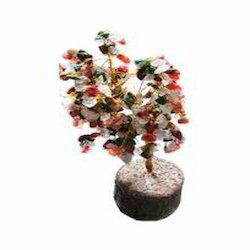 Navratna or Nine Gems Tree is a special fortune tree having a number of crystals. Navratna tree is most effective for achievement, prosperity, victory and health. People make use of Navratna tree for long and prosperous life. This tree provides serenity at the places where it is placed. This tree works well for reducing the negative energies around it. Navratna tree is advised to people who have depression and long illness. Besides being potentiated with Cosmic Energy, by chary Kalki Krishna himself, ’® energizes/consecrates Navratna Tree with mantras, superbly combining with some other potent verses, prior to being forwarded to you. Navratna tree delivers wealth luck to you. This tree brings pleasure in your life. Keep this tree for a profitable life. You can use this tree for very long life. This tree reduces unfavorable energies from your house. Navratna tree can help you in reducing your depressive disorders. 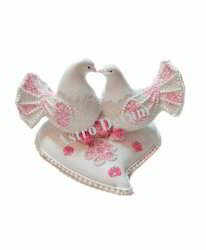 A set of Lovebirds is recognized as synonymous with love and romance. Lovebirds can be kept in South-West corner of your home otherwise in the south-West corner of bedroom simply because this corner is considered as the harbinger of love as well as romance. This will certainly improve your love life. You must not keep one single bird or three birds. A single bird can bring bad luck and three can spoil the relationship by enhancing the chance of third person’s entry in your relationship. You must make sure that these two birds possess different gender. 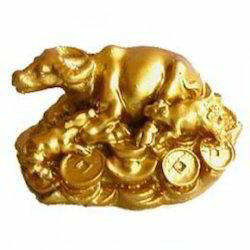 In Feng Shui, wealth cow (or wish-fulfilling cow) is widely used to meet your entire desires along with captivate good luck. Positioning Wealth Cow at your residence ensures that your upcoming generations will be flourishing. This Cow brings profitable business encounters, luck in investments, and luck in stocks speculation, success, prosperity, abundance, accomplishment. Students can keep this wealth cow to achieve good educational results. The Mandarin _ducks are classified as the most widely used, well known and traditional Feng Shui cures for love. In Feng Shui, a pair of Mandarin _Ducks signifies happiness in love and is an indication of romance, devotion, affection, conjugal fidelity, togetherness and enduring love. For singles, the pair of Mandarin _Ducks will improve your possibilities of finding love partners; for lovers, it will bring you marriage prospects; and for married couples, a pair of Mandarin _Ducks will hold out the promise of a marriage being gloriously happy with no separation between the spouses. Crystal pagoda tower carries particular forces, which assist to change unruly minds into well-disciplined minds. 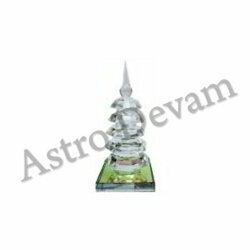 This crystal pagoda tower is an excellent booster for those who desire to achieve academic success. Students can put this tower inside their study room to improve concentration in studies and also to reduce energetic habits. It is especially helpful for children with distractive minds and for those who lack proper concentration Apart from being potentiated with Cosmic Energy, by Acharya Kalki Krishna himself, energizes/consecrates crystal pagoda tower with Vedic mantras, beautifully combining with some other potent verses, before being given to you. Wind Chimes are bells, which are manufactured from suspended tubes, rods or any other objects. Tubes used in this wind chime are made up of wood. This wind chime spreads positive energy where they are hanged. The best quantity of Money Frogs to have in your living room or garden is nine because this number symbolizes bringing in money from all directions of the compass. 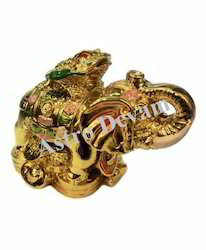 Ba Gua Mirror is commonly used to fend off unfavorable energies getting into a building mostly through the main door. The Pa Kua mirror, specifically energized by the team of ‘AstroDevam.com’®, will deflect the killing energies or Shar Chi produced by ‘poison arrows’ forwarded to your house, shop or building and prevent it from entering. Poison arrows are generated through many sources: offending poles, lampposts, trees, large building, edges of building, a road headed towards you, T-Junctions, escalators and other imposing structures, infrastructures or landscape in front of your house, shop or building’s main door, the ‘chi’ entry point. Ba Gua Mirror is Powerful Feng Shui cure and commonly used outside front door of house to correct Feng Shui and Vastu dosha. Crystal balls by are extremely popular contemporary Feng Shui remedy. A superior quality, clear crystal ball will transform the energy of light into a very enlightening, smooth and constant motion. 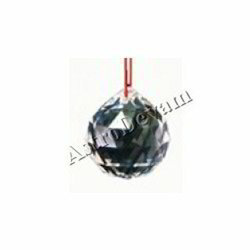 The primary objective of faceted crystal balls in Feng Shui is to transmute energy by means of light. 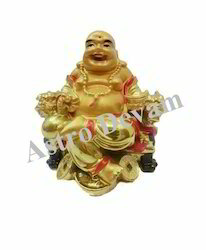 he laughing Buddha, also referred to as Pu-Tai, Hotei, Happy Man, God of wealth or Maitreya, is probably the most important cures of Feng Shui. The name laughing Buddha originates from its appearance as well as the feeling it invokes to the persons, looking at him. This Feng Shui sign represents success, achievement, abundance, happiness, good luck and financial gains. The Eight immortals are Chinese deities, originally chartered to come down through the heaven to assist humanity, which help us accomplish our objectives. Each of them possesses a unique excellent object and each of them has a special ability. Eight Immortals signifies longevity as well as good fortune. Eight immortals on dragon boat assist humanity to satisfy the following aspirations of life: wealth luck, recognition luck, reputation and fame, literary luck, military/business sharpness skills, humanity, integrity and discipline. You can place them in your house to achieve these aspirations. 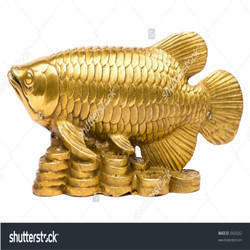 Fengshui, Arowana Fish is recognized as indication of good luck and numerous wealth. Arowana fish can be used to bring in achievement and prosperity. It is known that the fishes spare us from danger as well as bad luck. The Elephant with money toad offers you both power and wealth. Placing elephant with money toad produces massive wealth and you will definitely acquire power of facing hostile conditions. Elephant with money toad is designed for people who would like a boost in their work prospects as well as some wealth luck. 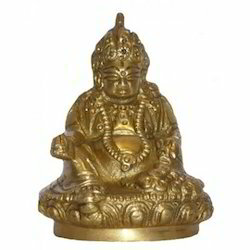 Lord Kuber is the lord of success as well as wealth according to Hindu mythology. Kuber is worshiped for convenient economic gains, unexpected gain of money through lotteries and a prosperous business. He protects the North Direction. 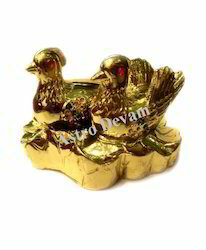 Kuber Murti provided by us brings prosperity, wealth and money in your life. This statue also minimizes unwanted expenses and aids in flourishing of your businesses. 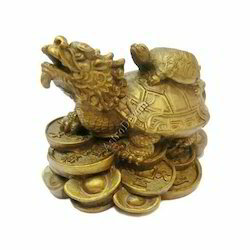 The Dragon with Tortoise, commonly called Dragon Turtle, when positioned on wealth containing bed of coins and ingots is an indication of good luck, longevity, protection, harmony and abundant wealth in Feng Shui. There are many characteristics assigned to this Feng Shui tool, from bringing in wealth to protection to improving career. 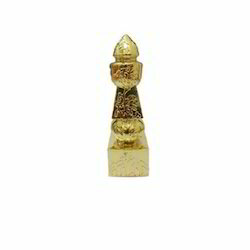 Five Element Pagoda tower is definitely a powerful Feng Shui product to soak up and retain the entire negative energies in its surroundings. Five elements pagoda tower incorporates five tiers, each conveying one of the basic elements of the universe: The earth, water, fire, wind and the sky. The lower part is a cube indicating the earth. Above the cube is a sphere symbolizing water. Above sphere is a triangular shape like pyramid representing fire. At the top of pyramid is a semi-sphere representing wind and placed on top is a jewel shaped section, which represents Sky ring. Five elements pagoda tower offers appropriate safety against different malicious stars such as the 5-Yellow star which creates mishaps and monetary loss, or “Sickness” star, which is the reason for illness and disease. Fengshui Ship is also referred to as Wealth Ship. 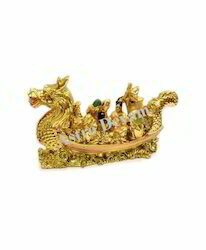 In Chinese culture, it is considered the most known wealth symbol after dragon. 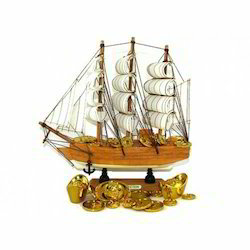 You can see wealth ship in most Chinese houses and buildings as traditional objects as well as prosperity amulets. 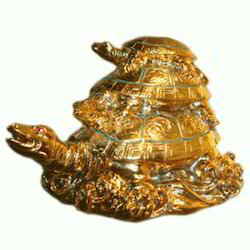 Tripple Tortoise also known as Feng Shui Tortoise is believed to have the power to bring positive Chi in the house. Among popular celestial animals tortoise is the one which exists even today. Triple tortoises do have the power to live up to a period of more than 100 years. Both in Vastu Shastra as well as in Feng Shui Triple Turtle symbolize harmony and longevity of a family. 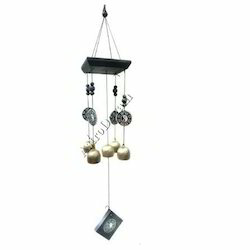 Metal Wind Chimes are bells that are constructed from suspended tubes or rods made up of metal. Wind chime spreads positive energy where they are hanged. Wind chime brings you success in every aspect of your life. If you want to attract good luck in your life, hang metal rods wind chime in your house. When wind blows through the wind chime, it sounds melodious music. This melodious song signifies that positive energy flows through the house. 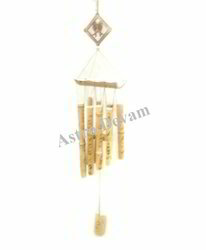 Five rods Wind Chimes represents the development of good luck coming from all five directions. Five rods of this wind chime signifies Earth and attracts positive energies from five directions namely North, East, South, West and Center. When wind passes through the wind chime, it sounds melodious music, thereby, spreading constructive energies at your residence. 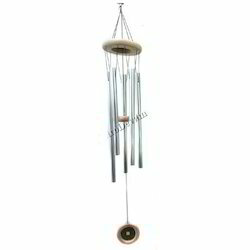 The Five rods Wind Chime consists of metal and containing 5 rods. This wind chime boosts your good luck. It brings success in every section of your life. 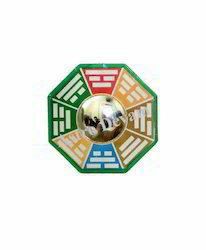 Looking for Fengshui Items ?